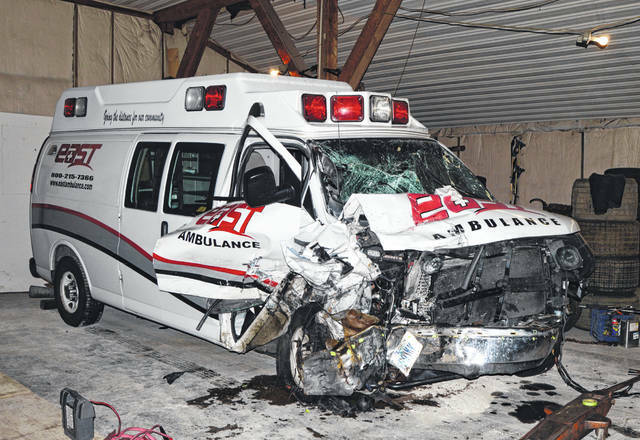 Shown is the ambulance struck head-on by a car near Hillsboro on Monday night. A Greenfield woman killed in a head-on collision Monday was not wearing her seat belt when the accident occurred, authorities said Wednesday. Christine Raike, 60, Greenfield, was killed when a vehicle in which she was a passenger struck an ambulance head-on on U.S. Route 62 north of Hillsboro, according to a press release from the Ohio State Highway Patrol. Raike was pronounced dead at Highland District Hospital. She was not restrained at the time of the impact, according to the patrol. As previously reported, a preliminary investigation indicates Raike was a passenger in a gray 2001 Chrysler 300, which was traveling southwest on U.S. Route 62 when it drove left of center and collided head-on with a 2013 Chevrolet ambulance headed the opposite direction, according to Sgt. Joshua Hunter of the patrol’s Wilmington Post. The Chrysler was driven by Donald Hill, 41, Hillsboro, Hunter said. Hill refused treatment at the scene. Another occupant, Nichole Edie, 32, Hillsboro, was transported to Highland District Hospital and later taken by medical helicopter to Miami Valley Hospital with serious injuries, Hunter said. The ambulance was driven by Kevin Poole, 36, Washington Court House, Hunter said, and Douglas Scott, 54, Washington Court House, was the only other occupant. There was no one being treated in the ambulance, Hunter said. Scott sustained non-life threatening injuries. Hunter said Poole’s condition was unknown. Hunter said investigators do not suspect drugs or alcohol as a factor in the collision.